I use a laptop as my sole machine. I find it irksome to wait for programs to start when Windows starts up. For example, I may want to start up, grab a document, and then shut down immediately. And, I’m just a really impatient person. Recently I moved all my start up programs into a subfolder in the Windows Startup folder. Now when the laptop boots, the folder opens, and I can pick the programs I want to start. It’s all about control, baby. First, open the All Users Startup folder. Second, create a new subfolder in the Startup folder (I just called mine Startup). 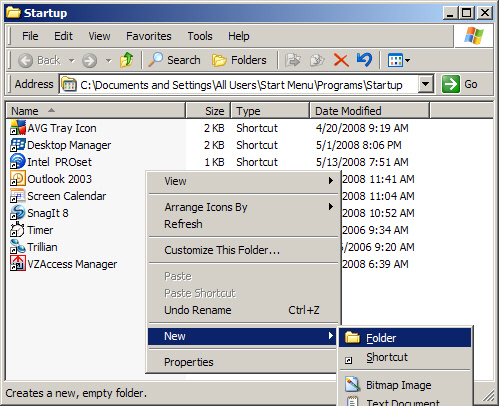 Third, move the shortcuts in the Startup folder into the new subfolder. That’s it. The next time you login, the folder with the short cuts will open on your desktop.